In a sea of more than a thousand journalists jostling for attention, Roman Tsymbalyuk will be holding a black-and-white “Ukraine” placard. His aim is to catch Vladimir Putin’s eye during the Russian president’s marathon annual press conference on December 14, to ask a nearly ritual question about the war in his homeland. Every year, Putin fields scores of questions at the year-end event — from the serious to the fawning — on anything from world politics to his love life, from macroeconomics to regional kvass production. Nationally televised and broadcast live across Russia’s 11 time zones, the show has long been a set piece on Putin’s political calendar and is used by the Kremlin to project an image of power, omniscience, and openness. Crucially, the format does not permit follow-up questions, meaning Putin’s answers go unchallenged. But it does occasionally bring Putin head-on with issues that buck the Kremlin-friendly narratives promoted by Russian state media. And Putin’s exchanges with Tsymbalyuk, who has asked about the war in Ukraine every year since it broke out in 2014, have become one of the more combative and colorful moments of the TV spectacle. Often in patriotic Ukrainian garb to attract attention so he is given the microphone, Tsymbalyuk has taken the floor in 2014, 2015, and 2016 to ask about the war. And in the second of these appearances, Tsymbalyuk’s question coaxed out the Russian president’s first acknowledgement — after a year of denials — that Moscow had sent military advisers into eastern Ukraine, contradicting the official Russian line. 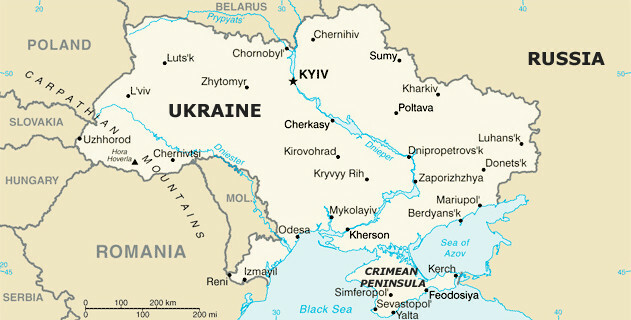 In February 2014, Moscow-backed Ukrainian President Viktor Yanukovych fled Ukraine amid a pro-Western revolution after which Russia annexed the Ukrainian peninsula of Crimea and backed a separatist war in the country’s east that has now killed more than 10,300 people. Later that year, Tsymbalyuk appeared at the press conference in a gray sweatshirt emblazoned with “Ukrop,” playing on a word for dill that was used by detractors to describe pro-Kyiv fighters in the Ukrainian conflict. In a quick-fire volley of questions, he asked Putin how many Russian soldiers and tanks had been sent to the Donbas to support the separatists and about the prospects of a prominent Ukrainian in Russian custody being freed. Despite considerable evidence to the contrary, Russia has insisted throughout the conflict that Russian troops have had no involvement in eastern Ukraine, asserting that the only Russians there have been “volunteer” fighters. The next year, Tsymbalyuk returned, this time wearing a loud yellow top and shirt and again asked about Russian soldiers. He added sarcastically that he was “sending regards” to Putin from two purported Russian intelligence officers captured by Kyiv’s forces in eastern Ukraine. In response, bucking the official line, Putin for the first admitted publicly that Russian military specialists had been deployed to Ukraine, although he emphasized that regular Russian forces had not been sent. Despite the caveat, the revelation sparked talk of the changing contours of Russia’s official narrative — although Tsymbalyuk said he was skeptical anything changed for Russians. The press conference was broadcast to Russians live on TV, but Tsymbalyuk said the revelation was skated over or forgotten in subsequent news and television reports. Tsymbalyuk is accredited for this year’s press conference. With days to go, he said he hadn’t yet formulated the wording of this year’s question. But he said he wants to ask Putin about talk of an international peacekeeping force for eastern Ukraine, which might require the Russia-backed separatists to give up control of the border to Ukraine. He also said he wants specifically to question comments by Putin invoking the 1995 massacre at Srebrenica, where 8,000 Muslim men and boys were killed by Bosnian Serbs during the Bosnian War. Putin was asked about the possibility of returning the Ukrainian border to Kyiv forces at the Valdai discussion club in October. He said he feared that the result would be a “bloodbath” and a situation similar to Srebrenica. Tsymbalyuk said he was shocked by such an assertion. “I want to ask, ‘Hang on a second, what are you doing there? '” he said. Nonetheless, the Ukrainian reporter is skeptical of the significance of difficult questions posed to Putin.